East Boston High back Brandon Ortega charges ahead for a big gain in Thursday’s 16-0 win over South Boston in the 99th meeting. 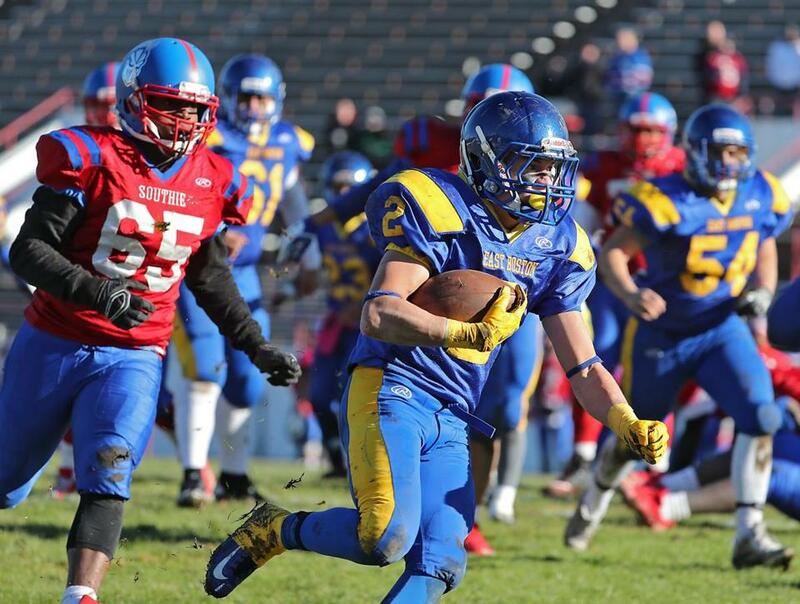 In the 99th Thanksgiving meeting between East Boston and South Boston, Brandon Ortega was determined to carry Eastie to victory. The senior back rushed for 101 yards and two touchdowns on 16 carries, powering the Jets to a 16-0 win at White Stadium on Thursday morning, his program’s ninth straight win in the series. “I just had to run, run the ball, run inside,” said the 5-foot-9-inch, 160-pound Ortega. Ortega launched his Jets over the top early. With 4:33 on the clock in the first quarter, Ortega shot into the end zone on a 1-yard rush, followed by a 2-point conversion rush. With 8 points on the scoreboard, Eastie was far from done. Midway through the second quarter, Ortega eluded Southie defenders for a 13-yard touchdown. Junior quarterback Dom Russo tossed the conversion pass to senior Matt Findlay to secure another 2. 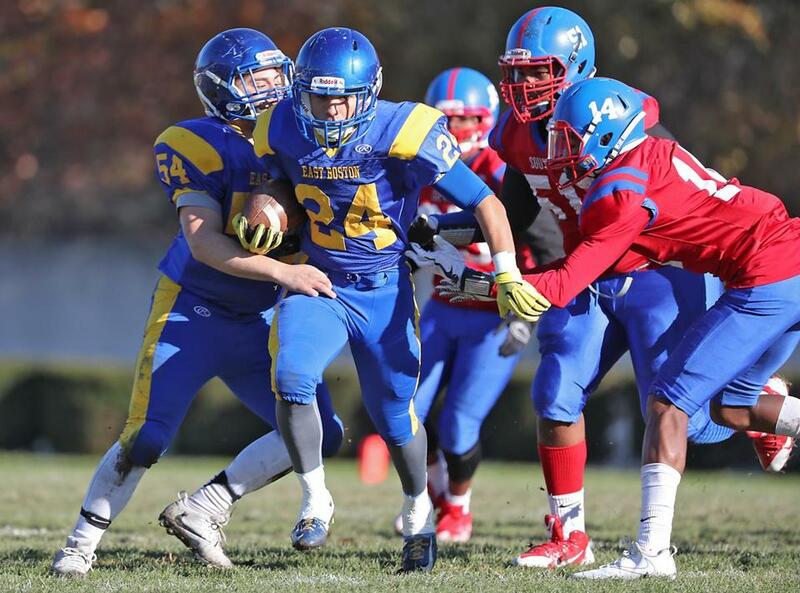 East Boston shut down the Knights’ drives all morning, but never more so than in the third quarter, when senior defensive back Richard Bynum snatched a fumble from South Boston. 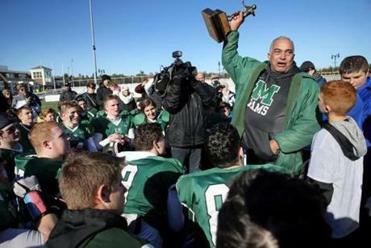 “The kids didn’t want to let anyone get behind them,” said East Boston coach John Parziale after his squad closed out a 6-4 season. South Boston finished 3-7. In the fourth quarter, South Boston drove to the Eastie 27-yard line. But Kasey Vasquez leaped to a intercept a pass by Nathan Martin to derail the threat. 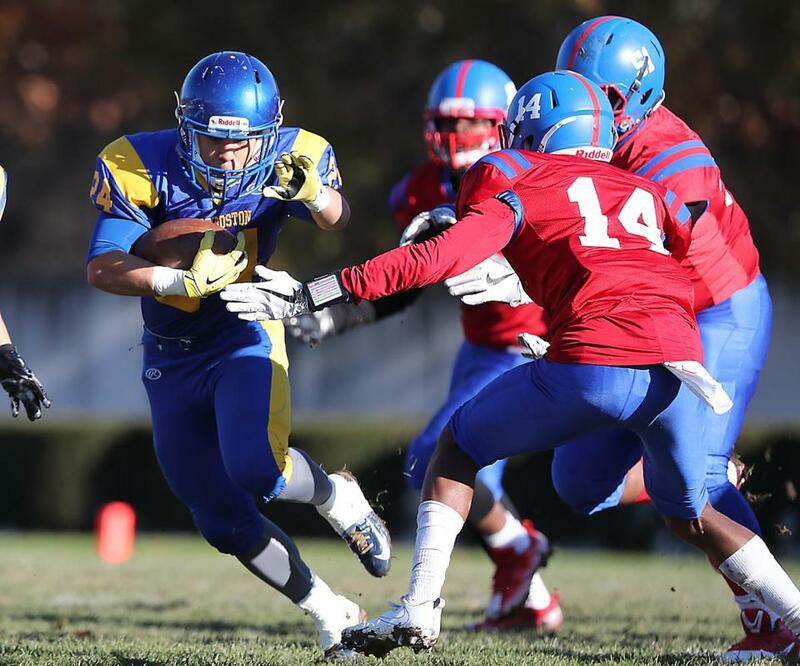 East Boston’s Angelo Blake breaks through an arm tackle by South Boston High Xavier Edwards-Lewis. East Boston’s Angelo Blake puts a move a pair of South Boston defenders.